When we got up late the morning of the next day, when we left the Edison Hotel, a long procession came into our eyes. So when I asked the women in the line, "What is it?" "We can buy a day ticket for the musical at half price, so we are standing at 10 am to secure the show we want to see." Replied that. There was no way to miss such a good deal, and we were at the end of the line. Then, looking around carefully, old and young men and women were holding a cup of coffee and donuts in their hands and talking. And I was particularly interested in middle-aged men and beautiful young male gay couples. The older man took care of the young man by handing a cup of hot coffee and letting him know that the ticket he wanted to see was not yet sold out. In my view, they were enjoying this long row. Also, we were not bored at all, with the appearance of poetry readings and single performers with the aim of showing them to the procession. As a result of joining the long line, we purchased the S seat of the highly acclaimed "A CHORUS LINE" at half price, and we went out for a tour of the New York Stock Exchange lightly. 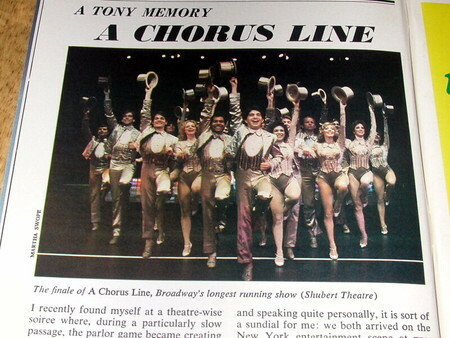 The musical "A CHORUS LINE" I saw that night was not completely understood by my English ability, but I still understood quite the harsh reciprocity arising from ethnic and racial conflicts. "A CHORUS LINE" is a drama unique to a country where multiple ethnic groups live together. Anyway, on this trip, staying at the "Edison Hotel" on Broadway 47th Street, which is the half price ticket office on the day of Times Square, prompted me to open my musical eyes. Our trip to New York this time is a 3-night stay, the main purpose is to see museum visits, visits to the New York Stock Exchange, and to see the musical “The Phantom of the Opera”, which was well-received in Japan at that time It was. So we left Fifth Avenue and went to the ticket office, and applied for a ticket for "The Phantom of the Opera", but the sales staff said it was "all sold out for three years" and was stunned. And we bought the S seat of the musical "La Cage aux Folles" for around $ 50, and we went to the theater after dinner. We were moved to know that the love of gay and heterosexual couples is the same in this musical, and the depth of maternal love for the son of the gay male partner. This time in New York, we chose the Edison Hotel at Broadway 47, which is cheap and convenient for transportation. And when we went to the hotel room after the musical was over, the floor stand did not light up. It is a hotel with the name of Edison who invented electricity, and it is neither a joke nor a light if it doesn't turn on, but I hesitated for a while to explain to the front desk in our poor English. However, when a friend who had a slightly higher English level than I called to the front desk "light is damaged", a young Korean man appeared immediately to solve the problem. 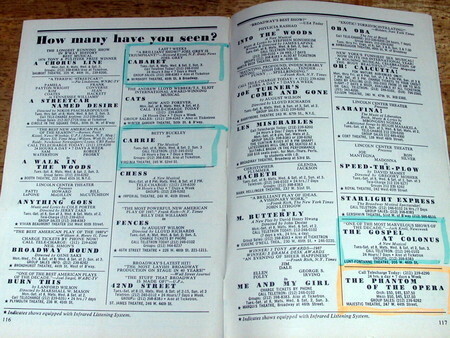 The photo is a Broadway theater performance list at the time. After leaving the café, we encountered a majestic brass band followed by a funeral march followed by four cops spread stars and stripes, a black-painted hearse, and a uniform cop. I thought that I would encounter a majestic funeral march on Fifth Avenue, the first time I set in, but when I listened to the conversations of those around me, it was like the funeral of a police officer who died on the mission. Once again we regained the sight of the tourists, and as we were wandering around here and there, the beautiful hymns came to me, so we were invited to the melody and we went to the majestic steeple church (St. Patrick's Cathedral) I stepped in. And when we try to sit on a vacant bench, a middle-aged man next seat acts to chase us away, so if I ignore it and try to sit down again, the man pointed to the door with a go . Is this not racism? 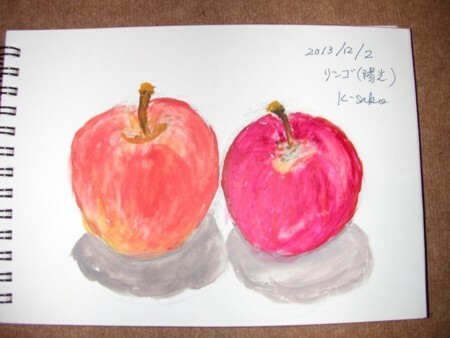 When we hardened our attitude, a calm middle-aged man who was sitting nearby pointed our backs and warned us, so we back each other It was the first time I saw that I understood the steep look of the men in the next seat. And when we try to sit on a vacant bench, a middle-aged man next next seat acts to chase us away, so if I ignore it and try to sit down again, the man pointed to the door with a go . And when we try to sit on a vacant bench, a middle-aged man next door acts to chase us away, so if I ignore it and try to sit down again, the man pointed to the door with a go . After gazing at the glamorousness of Fifth Avenue, which we entered for the first time, we stopped at a large, glass-lined bookstore. I enjoyed the layout of various books in the sales floor, grabbed books such as art books, photo books, magazines such as The New Yorker and VOGUE, and the novels of writers familiar with The New Yorker , and turned the page even though I didn't have much English skills . Later on, I bought three copies of my favorite Raymond Chandler's Philip Marlow series and Georges Simenon's Maigret police series on paperback. 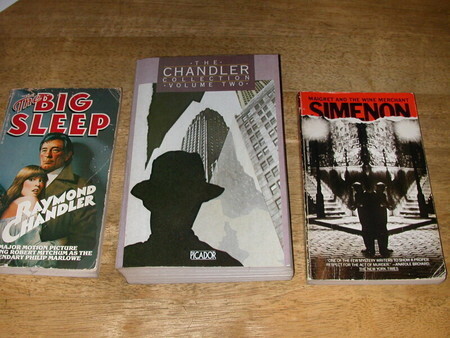 It is natural to read American Chandler's novel in English, but I thought that it would be rather difficult to read the original book by Georges Simenon in French with an English translation. After leaving the bookstore, we sat down by the window of a sophisticated cafe, relaxing with chocolate cake and fragrant coffee. I went to New York for the first time in early May of 1986. After enjoying the New Orleans Jazz Festival, I and my friends took a tour of Quebec, and the end was New York. We left our luggage at the popular Edison Hotel on Broadway and took to the 5th Avenue with a leather jumper bought in Quebec. After all, rich and talented people from all over the world are concentrated in the Fifth Avenue in New York, and there are diverse people with different nationalities and skin colors on colorful streets. And from the stalls on the street, the fragrant smell of hot dogs, bagels, and pretzels was flowing to make our appetite. 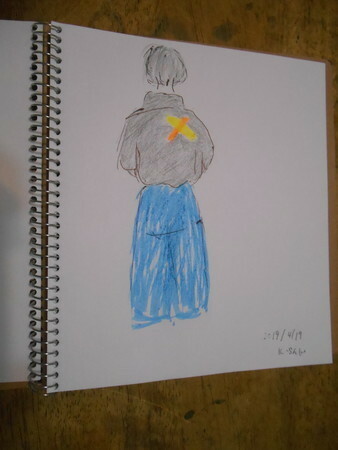 However, when the first excitement got over and my eyes got used to it, I realized that many of the people who went on the road dressed as expensive brand products were Japanese. In Tiffany's case, it was only the appearance of the Japanese that had made a product definition in the in-store showcase, and it was just like the "Japanese who occupies Tiffany". On the other hand, we of the same Japanese but in a clerical job have no money to buy Tiffany & expensive jewelry, but buy a thin 18K gold choker with a small petite pendant at a popular accessory store in Trump Tower. It was at best.